Port Blair, Sept. 20: The Lt Governor, Lt Gen (Retd) A. K. Singh, PVSM, AVSM, SM, VSM, reviewed the functioning of Agriculture, Animal Husbandry and Fisheries Departments yesterday. Chief Secretary, Shri Anand Prakash, Secretary (Fisheries/ AH & VS/Agri. ), Secretary to LG and officers of these Departments were present. Presentations were made to Hon’ble Lt Governor on the activities of the Departments. Directions were issued that steps are to be taken to increase the fish production from the Territorial Waters of Andaman and Nicobar Islands from 37% to 75% in the next five years. Appropriate subsidy schemes need to be worked out to empower the local fishermen to exploit the resources in the Territorial Waters by introducing intermediary fishing crafts in a phased manner. Directions were issued to Secretary (Fisheries) to work on an action plan on priority basis to develop skilled manpower so as to meet the specialized requirement in the fisheries sector. 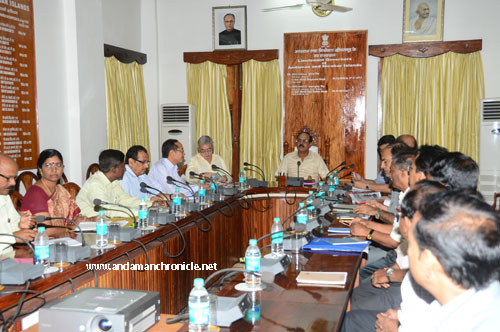 The Lt Governor further directed that a plan be prepared for the revival of M/s Andaman Fisheries Limited, a subsidiary of M/s ANIIDCO. Besides, setting of Modern Fish Markets in the Islands is also to be taken with assistance of the National Fisheries Development Board (NFDB). The Chief Secretary and Secretary (Fisheries) were asked to follow up on the proposal for establishing two Oceanariums, at Port Blair and Havelock. He also directed that the A&N Administration should explore the possibilities of having joint ventures for exploiting the Tuna fish potential including setting up of canning and marketing facilities. On the Animal Husbandry sector, the Secretary (Animal Husbandry) apprised the Lt Governor about status of the departmental institutions and mobile veterinary dispensaries in different Islands besides the main activities of the department. The Lt Governor issued directions to Secretary and Director (AH&VS) as well to take up necessary steps to expedite the project of processing and transportation of milk from North & Middle Andaman to Port Blair. On the Agriculture front, the Lt Governor issued directions for working on an action plan for reducing the use of chemical fertilizers and pesticides and to enhance assistance for promotion of organic cultivation. Directions were issued to promote and publicize adoption of organic farming on a wider scale and provide assured market for the organic produce of the farmers. Incentives are to be prepared for the farmers to adopt organic cultivation. The Lt Governor issued directions to the Department to take up the issue of diversion of agricultural land with the concerned authorities so as to ensure that land is utilized for cultivation, failing which the concerned authorities should resume the land lying vacant as per legal provisions. He further instructed to the Agriculture Department to plan for self sufficiency in vegetable and tropical fruits production and target for export of surplus production.